I’ve been asked recently what it takes to be a good brakeman. I’ve been mentoring an aspiring brakeman over the last year, so I’ve had some time to think about it. It’s more than just a five-second push at the top of the track and then hopping in for the ride. If you want to be able to contribute the most you can to your pilot, it’s more than just a physical effort at the start. Don’t get me wrong, you have to be fast and you have to be strong — very fast and very strong, I should say — but you don’t necessarily have to be the fastest or the strongest to have the best combination that’s needed to be a good bobsledder. Timing, for example, is extremely important. You have 50 metres at the start, but the grooves that the sled fits in only last for the first 35. If you jump in after the grooves end, you’re risking jostling the sled and having it fishtail and sliding and all that and then you’ve just lost all of your velocity. Normally a brakeman will need to get in before the ending of those grooves, but that being said, some tracks are a lot steeper than others, so you have to factor that into your preparation. You could literally run two stride-lengths too short or you could run two stride lengths too far. And believe me, losing that one-hundredth of a second does cost you. That’s what I loved about bobsledding; it's a sport in which the podium is decided by fractions of a second or inches. Those precious fractions are made up everywhere down the track. If you don’t run far enough, then you won’t have a fast enough start time. But, if you run too far, even by one stride length, you may have a faster start time but without realizing it you will most likely have to pull back on the sled in order to jump in, reducing the sled’s velocity which is vital to the speeds the rest of the way down the track. Most people think that once you hop in, a brakeman’s job is finished. For some people that will be true. But if you want to be a good brakeman — the best brakeman — when you jump in the sled your job is just beginning. A good brakeman will know all the corners of the track, and be able to give feedback to the driver after each run. I think that’s one of the positive things I brought to the team and to my driver, whomever that would have been at the time. A brakeman is not distracted by visual stimuli because all they see is the bottom of the sled. Therefore, they can, literally, feel everything going on with the sled, and can help their driver after each run by letting them know what they felt. But, that feedback has to be welcome. No one likes a backseat driver — in a car or a sled — so it’s critical to build up a relationship with the driver to the point that your driver is open to it. If they are, and there’s an instance when they don’t know exactly what happened in a particular corner, you can provide feedback by saying something like “well, we did tap the wall before Corner 3”, which can help the driver assess the sequence of events from that point on, helping to bring clarity to the driver. That feedback can help the driver figure out how to make corrections and improve for the next run. Drivers can’t be expected to remember every single thing that happens on the way down, although, to their credit, they remember quite a bit. For them, it’s changing a driving angle by inches while going 140 kilometers an hour. To be able to help your driver by providing more than just a fast push at the start of the race is pretty vital. 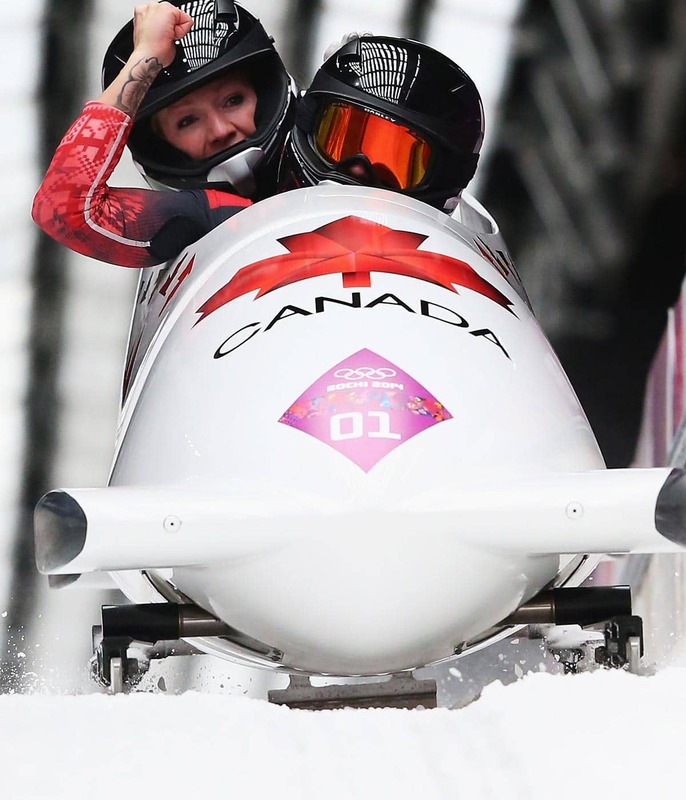 For my driver Kaillie Humphries and I, all that physical and mental preparation came together for our race at the Sochi Olympics. Right before Sochi, Kaillie and I had a race in St. Moritz, Switzerland and halfway down the track on our first run we hit the roof in one of the corners. We lost so much speed that we were sitting in 10th place at the end of that heat. I could tell that Kaillie was frustrated with herself. It was a mistake she hadn’t made at all during training so she was really discouraged, and that mindset could have easily led to throwing in the towel for the next (and final) heat of that World Cup race. After that first run, on the truck ride back to the top, I told Kaillie to do whatever she needed in terms of fixing the mistake, but that I didn’t care if we won or not. And that was the truth. At that point, winning really didn’t seem like an option anymore anyway. I just didn’t want us to give up and slack off for the next run, so I told her that we had one run left and all I wanted was to leave one wicked run on that track that people would remember. The pressure of winning was off the table. And, without having any expectations of winning (or even medalling), we ended up having an amazing run; we were the only team to go sub-51 seconds with a time of 50.91 seconds, moving up from 10th place to first! Not only were we the fastest of that heat, but that run was the fastest run of the entire competition, and we actually won the whole race. Never, in the history of bobsledding, had a sled ever made that big of a jump in race standings. From 10th to first: Moyse, Humphries have amazing turnaround. Having that experience under our belts less than a month before the Sochi Olympics was a huge advantage because we were trailing behind the Americans heading into our fourth and final run of the competition. Knowing that we had overcome a bigger deficit in St. Moritz helped us stay focused on the process of execution and on the things we could control, and not get sidetracked or distracted by thinking of desired outcomes, the strengths of other teams, or the ‘what ifs’ of regret. You don’t become a good brakeman overnight. You must be willing to put in the work in the gym to get that great start, because your consistent physical performances under pressure will provide a peace of mind to your driver; they won’t have to worry about you being prepared. You also must learn how to be a "backseat leader." You must study the tracks and learn the corners in case your driver asks for feedback. Being a good brakeman means being a good teammate, and that means not only knowing what it takes for you to succeed, but also what it takes for your teammate to succeed. When it comes down to it, it’s just you and your driver in that sled, so being on the same page — whether they need a serious pep talk or a joke (or even a serenade with made up lyrics in the start house to lighten the mood) — is critical to your performance as a team. For that, you’ll need to do more than just read this article. For that, you need leadership.